Weedle in game: 4,047 Who? Important notice! Pokemon Weedle is a fictional character of humans. Weedle (Japanese: ?—?? Beedle) is a dual-type Bug/Poison Pokémon. Weedle is a small larva Pokémon with a segmented body ranging in color from yellow to reddish-brown. 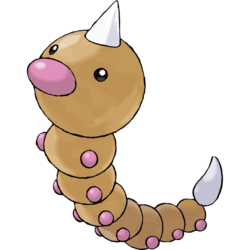 Combined with its red nose and feet, Weedle's bright coloration wards off its enemies. 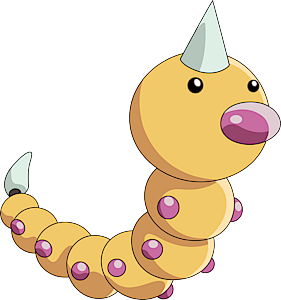 Weedle has a conical, two-inch (five centimeter) venomous stinger on its head and a barbed one on its tail, but its other body parts are spherical. 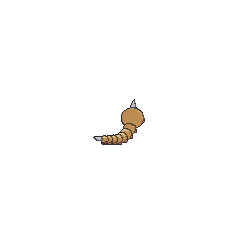 Weedle can retaliate against attackers and those who step on it with its strong toxin. It can distinguish its favorite kinds of leaves using its acute sense of smell. 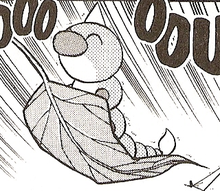 As a young Bug Pokémon, its daily appetite for leaves matches its weight. Weedle can be found in forests and usually hides in grass, bushes, and under the leaves it eats. In Challenge of the Samurai, Ash was very close to catching a Weedle. He used his newly caught Pidgeotto to battle, Weedle was knocked unconscious and when Ash was about to throw his Poké Ball, Samurai came up and asked Ash if he was a Trainer from Pallet Town. This distracted Ash from catching the Weedle, so it got away. This same Weedle later warned its kind and together, they tried to avenge its near capture by attacking his friends. Casey captured a Weedle during the Bug-Catching Contest in The Bug Stops Here. She released it in accordance with Contest rules. Weedle appeared a few other times while Ash was in Viridian Forest, such as when a number of them ate Team Rocket's cardboard tank. A Weedle appeared in The Ultimate Test under the ownership of a Trainer who allowed Todd to photograph it. Due to a coloring error, this Weedle was colored green like a Caterpie. Generation II revealed that Shiny Weedle are green as well. Multiple pink Weedle resided on the Pinkan Island in In the Pink. Weedle had a small cameo in Tracey Gets Bugged as one of the Bug Pokémon on Murcott Island. A Weedle appeared in Illusion Confusion! as an illusion created by Haunter and Gengar. Multiple Weedle also appeared in Celebi: Voice of the Forest. A Weedle was one of the inhabitants of a Pokémon oasis in Got Miltank?. Multiple Weedle appeared in For Ho-Oh the Bells Toll! where they protected the Tin Tower after Team Rocket stole the crystal bells on the top floor. 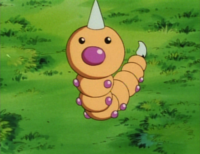 In Talkin' 'Bout an Evolution, one of the Pokémon made ill by Team Rocket's experiments was a Weedle. A Weedle was seen in a forest outside the Ice Path in EP250. A Weedle was used by one of the students of the Pokémon Trainer's School in Gonna Rule The School!. A Weedle appeared in The Saffron Con as a Pokémon owned by a Coordinator that was taken by Team Rocket. An injured Weedle appeared in One Big Happiny Family! and was healed by Nurse Joy. Two Weedle appeared on the picture in the gallery museum in A Blustery Santalune Gym Battle!. A Weedle appeared in SM003, as a silhouette. Weedle first appears in Bulbasaur, Come Home! as one of the Pokémon that escapes from Professor Oak's Laboratory. A Weedle appeared reuniting with its trainer in Buzz Off, Electabuzz!. Gold owns a Weedle which he keeps at his house in Murkrow Row. A Weedle later appeared in Absolutely Azumarill, where Crystal failed to catch it. 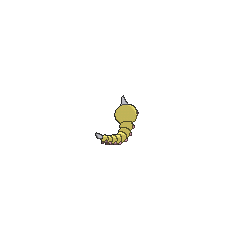 A Weedle appeared in The Last Battle XIII as one of the Pokémon sent to help the fight in Ilex Forest. In addition, Weedle is tied with five other Pokémon for having the lowest Special Defense stat of all Pokémon, and has the lowest Special Defense of both Poison-type and Bug-type Pokémon. 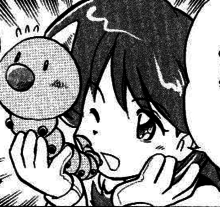 Until Platinum, Weedle was completely incapable of dealing damage to Steel-type Pokémon—outside of Struggle—because it could only learn Poison Sting, to which Steel types are immune. From Platinum onward, Weedle can learn Bug Bite. Weedle is likely a combination of worm and needle, referring to the stingers on its body. It may also be a corruption of weevil, another sort of bug. Cantonese Chinese ??? Duhkgokchùhng Literally "Single-horned bug"
Mandarin Chinese ??? / ??? Dújiaochóng Literally "Single-horned bug"